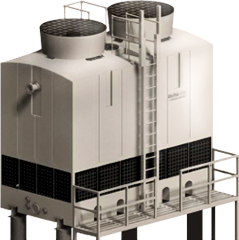 Water cooling towers are some of the most essential pieces of equipment for commercial and industrial buildings today. Cooling towers may either use the evaporation of water to remove process heat to cool the process fluid, or may use forced or convective air to cool the process fluid. Wet cooling towers use the natural process of evaporation (of water) to cool equipment. They rely on an exchange of heat between the equipment, the water in the tower, and the air passing through the tower. Excess process heat is absorbed by the water in the cooling tower as it passes through a labyrinth of fins and tubes in the structure. As the water is warmed, it comes into direct contact with cool air passing through the tower. The interaction between cool air and warm water causes the warmest water droplets to evaporate and is released out of the tower into the atmosphere. The remaining water cools back down and can be reused through the system again. Common applications include cooling the circulating water used in refineries, chemical plants, power stations and HVAC systems for cooling buildings. Due to the cost-effectiveness and readily available supply of water, companies use wet cooling towers to provide cooling continuously and cheaply. While cooling towers are normally defined as “a heat rejection device which rejects waste heat to the atmosphere through the cooling of a water stream to a lower temperature”, one must keep in mind that the “waste heat” emissions are just water droplets, and are not harmful to the atmosphere nor to the environment.